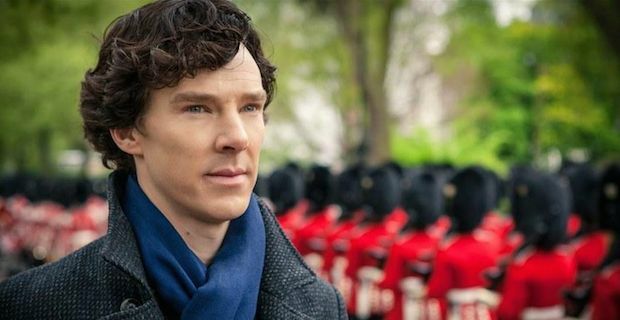 The writers of Sherlock have been dropping major hints as to what season 4 will have in store for fans. Exectutive Producer and writer Steven Moffat along with fellow producer and writer Mark Gatiss have teased everybody by saying that they are about to make things a lot "darker". Speaking at the after party of the Emmys, Moffat revealed that they are definitely looking to improve on Season 3 saying "We have a plan to top it. And I do think our plan is devastating. We have practically reduced our cast to tears telling them the plan". He also added that himself and Gatiss are "probably more excited than we’ve ever been about Sherlock." Gatiss was also quizzed rather thoroughly by Entertainment Weekly on what is in the pipeline Season 4 and his answer will no doubt get fans quite excited. Gatiss said "We’re going to try to take it somewhere we’ve never been before. And I don’t mean outer space. It will be a challenging place to go. We always start with a reintroduction that builds toward a darker climax and we might just be going darker. We've got a very, very good set of ideas." Season 4 of Sherlock is due begin filming late in 2015 so fans will need to show a certain amount of patience. But it won't be all waiting because a one-off special is due to commence shooting in January to tie fans over before Season 4 hits BBC screens. The special will revolve around Moriarty's face being plastered across TV screens throughout the land as Sherlock tries to uncover who is behind the propaganda. Season 3 of Sherlock was richly rewarded at the 2014 Emmys this week with the finale episode "His Last Vow" coming in for special attention. Benedict Cumberbatch and Martin Freeman respectively won Best Actor and Best Supporting Actor in a mini-series for the episode while Steven Moffat was recognised as Best Writing for a mini-series for penning the episode.